Few periods in history conjure up images of sword-wielding badassery better than feudal Japan. Developer Juri Slepika of Thunder Bird Animations, takes players back to a time when ninjas and bandits clashed steel with powerful samurai in Spear and Katana. Hitori Hanzo would be proud. The top-down perspective, clean graphics, and minimalist art style are charming; enemies yelp when you hit them with your blade, swords clang, and spatters of blood paint the terrain when a hit is landed. You’ll start off with some one-on-one duels, but it won’t be long before you’re fighting multiple enemies, sometimes with the help of allies. The story often branches, letting you choose the side of conflict you prefer. Clashes are generally quick and brutal. The controls are simple to learn, but the challenge ramps up quickly. 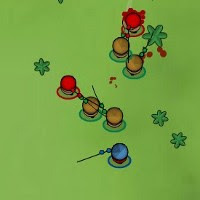 A couple of well landed chops are usually enough to dispatch a foe (or for them to kill you), and striking a side or flank will cause considerably more damage. (I also recommend enabling the “Aim by Mouse” option in the controls menu.) Thankfully, “button-mashing,” will only get you so far, adding a layer of tactics rare in similar games. Overall, Spear and Katana delivers an action-packed experience that’s a lot of fun, although the more challenging fights may make some want to commit seppuku.